Fashion Designer Kenneth Cole speaks to the media at a press conference on his appointment as an International Goodwill Ambassador for the Joint United Nations Programme on HIV and AIDS (UNAIDS). Rather than see an end of AIDS by 2030, “we could see AIDS back to its historical level of devastation,” he emphasized. A world renowned, New York-based fashion designer and businessman, Mr. Cole has been an influential voice in the global response to AIDS for more than 30 years. He has also been Chair of the American Foundation for AIDS Research (amfAR) since 2005. The podcast features another long-time AIDS campaigner and activist, singer and songwriter Annie Lennox, who has been a UNAIDS International Goodwill Ambassador since 2010. To highlight the realities of living with HIV/AIDS in Africa today, she interviews Loyce Mataru of Zimbabwe, who had just lost her mother and son to the virus, when she found out she herself was HIV positive. She is now living a full and healthy life, and having once tried to commit suicide because of her status, she talks movingly about the stigma of living with HIV. 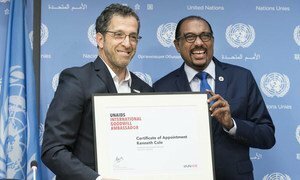 The Joint UN Programme on HIV/AIDS (UNAIDS) today appointed the Chair of the American Foundation for AIDS Research (amfAR) and leading fashion designer Kenneth Cole as a UNAIDS International Goodwill Ambassador.